Who dosen’t want to fly? I think almost ever single person out there has once dreamed of what it would be like to fly. I myself get to fly and sore through the air every time my cheer group gets together. I can tell you this, flying is the most amazing experience ever. The rush you feel in your stomach as you reach new hights or the adrenaline you feel when you flip and turn in mid air is like nothing you’ve felt before. Having the flying position in cheer is like being the quarterback in football, centre fielder in soccer, or the the point guard in basketball. You have a huge job to with hold on your team. In cheer the flyer is under the spot light at all times. Getting to fly you must be very flexible and strong, there is no weight or size requirement, only that you can be able to keep yourself up there and be stable. You should be able to do the splits on both sides so that when your in the air it doesn’t matter what leg your standing on you can lift either leg up into a heel stretch. Types of pulls a flyer should be able to do are: heel stretches on both legs, a scorp, an arabesque, and have a goal of a needle. Other things the flyer must be able to do is full and double down. This means the flyer can do one to two spins in the air while she is falling back into her group. 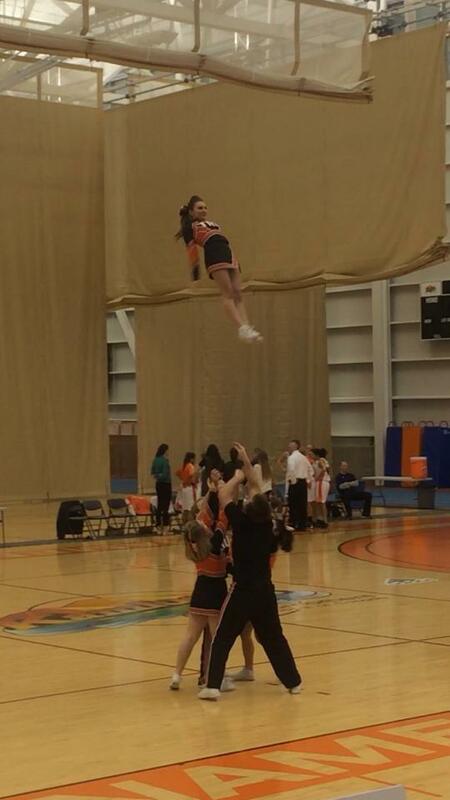 Also, the flyer must also be able to do a basket. 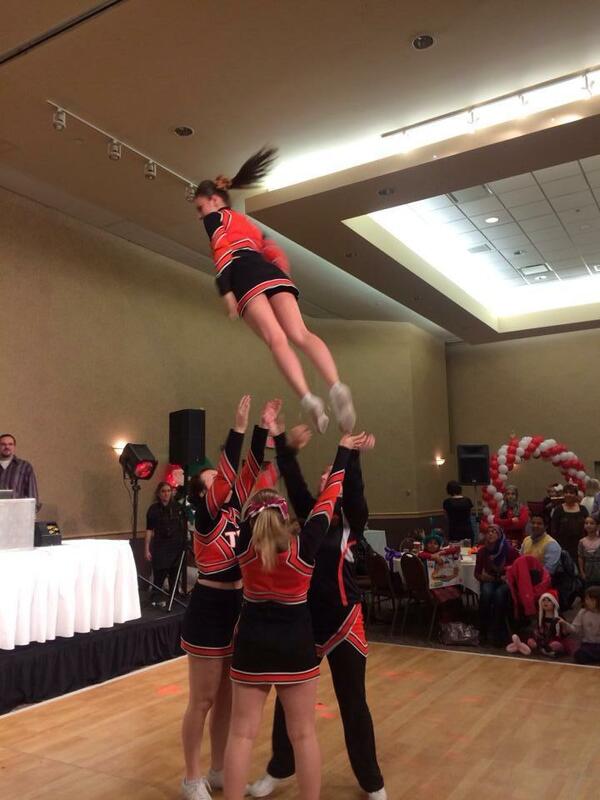 This is when the flyer gets the most hight from being thrown into the air. While the flyer reacher the peak of the hight she must pull one to three skills in mid air like, pike star, or pike peter, or double down. Do you think you got what it takes to fly? Theres more to flying than just free floating and being relaxed. It can be a very scary thing being shot fifteen feet in the air and hoping that your stunt group catches you. You must have a lot of trust and faith over fear. To us we truly believe if you look and feel great than all there is to worry about is doing good out on the mat in front of the crowd. Performing in front of massive crowds can be very nerve racking and the last thing you should be thinking about is if your hair looks okay or your makeup. Due to this we Cheerleaders spend countless hours doing our makeup and hair before a routine. Even though a routine lasts only two minutes and thirty seconds, we still aim for perfection. It is very common among Cheerleaders to wear a ton of sparkles. Under the big spot lights we shine with all the glitter on us. Who doesn’t want to glow when they are on stage? Another thing is Cheerleaders have to keep their hair up and in tight pony-tales because we do not want our hair catching under anyones hands or feet. This is why you see Cheerleaders with super high pony-tales with tight curls, to keep it out of the way while still looking fabulous. If a Cheerleader looks good they truly believe that they will perform well and accomplish great things. Not because our looks mean everything but, because we can than worry about the more important things like the stunts and tumbling. Stunting is the major part of Cheerleading. This is when you see people getting tossed in the air. Stunting could not be possible without the help of each athlete. In a stunt group there is usually four people. A flyer, the person who gets thrown into the air, two bases, the people who are holding the flyers feet when they are in the air, and one third, who is behind the flyer at all times watching their back side. The flyer must stay super tight to be able to go into the air. If she is not tight she will fall. The bases are what I like to call “Power Houses”, they are all the strength and power which puts up a flyer. I am a flyer in my stunt group. The types of stunts we pull in front of an audience are things like: Double-Base, Extension, Torch, Lib, and Baskets (I will provided pictures of my stunt group at the end to show you what these stunts look like). Most of these stunts I full out of, which means I spin myself in the air and into my group, were they catch me. Cheerleading is the most dangerous sport, due to things like stunting. If the group is not paying attention they could easily cause harm to one another. Communication is key when working in a stunt group. As dangerous as stunting is, it is also a blast when you hit your stunts as a group. It feels so good to accomplish such a thing. Who ever thought to lift people above their heads and try to perform different skills must of been crazy. Interested in tumbling? Yes it is a lot of fun! The idea of throwing yourself through the air while doing back flips, front flips and spinning sure is tons of fun, until you learn what eating the mat is. Tumbling is the major gymnastics part of cheer. You have to have a great amount of strength to lift yourself and flip yourself. You arms will looked jacked after a couple months from tumbling. Your core has to be extremely strong and you most definitely need strong legs. The stronger you are the more power you have. A tumbling sequence is when you link a variety of skills together to get a cross the mat. Most tumbling sequences start with a round off. A round off is like a cartwheel, but you land on two feet instead of one at a time. The round of should be strong and powerful so that when you land the roundoff you find yourself jumping high or falling backwards because of the force of power you put into it. The major power comes from your shoulders. When your arms hit the ground you have to push off extremely fast and hard to get a good landing. Once you have your roundoff nailed, you can start adding a second skill. The point of having so much power after the round off is so that you can use that power for your next skill. For example, most people will first link a back handspring after the roundoff. A back handspring is when you jump backwards on to your hands, making the body position of a bridge, then swing your feet up into the position of a handstand, and then you drop your feet making your self land back up on your feet, right side up (this is demonstrated in a video at the end of the blog by Logan Keegan). Another skill that can be linked to the tumbling sequence we have right now ( a roundoff back handspring) is a back tuck. A back tuck is a standing back flip in other words. To get this skill you need the ability to jump high and rotate yourself quick in the air, tight like a ball (this is also demonstrated by Logan Keegan in a video at the end). Tumbling is great fun once the skills are learned, but it takes a lot of practice. When learning to tumbling you will eat mat a lot. You tend to land on your face when tumbling because of all the rotating of your body. Which makes you look like your are literally eating the mat. Please be careful if trying this at home. I suggest you don’t, but if you are interested in learning them you can get involved at a gymnastics gym and there they will provided you with the proper lessons and techniques. Check out our local gymnastics center at the Tournament Capital Center on Thursday nights for drop in for tumbling practice. Good question! Well let me tell you. All-star cheerleading takes being in a sport to a whole new level. These all-star cheerleaders do not cheer for teams they compete just like other sports do. You don’t see basketball players on the side lines cheering on a soccer team, do you? Well thats just it. When people think of cheerleading they think, sideline cheerleaders. The first question I get asked being a cheerleader is, “what sport do you cheer for?” Not many people realize that cheerleading has a whole other side to it. All-star cheerleaders are attending from fifty to sixty hours of practice a week. With the amount of practices and competitions you have to attend, you could not work a full time job, trying to add a life to that,is hard enough. These girls train insane; they all want to be the best and look perfect because every flaw on the competition mat is a deduction. Having to be and look perfect all the time also take a toll on the girls. The amount of stress that comes with cheerleading is through the roof. These all-star cheerleaders have to be able to perform different tumbling passes, like a round off, backhand-spring, back tuck, layout (I will explain and show what this is in blogs to come). These are different types of skills the girls and guys need to make an all-star team. They also need to be very flexible for the jump sequence in the routine, which is when you just up of the ground and do the splits in the air. Also, they need the strength. The strength is so important for both the tumbling and the jumping part but also for the stunting. The girls and guys on the team have to lift a flyer into the air, hold her there while she pulls different things like a heel stretch, or toss her into the air as high as possible. These flyers can be anywhere from eighty to one-hundred and thirty pounds. Doesn’t sound too simple anymore does it? The tasks these all-star cheerleaders have to perform are a lot harder done than said. In further blogs I will explain and show you what tumbling, jumping, and stunting looks like for better understanding. You will get to see all-start teams and hopefully gain a better perspective on what the sport is really all about. This blog will discuss everything there is to do with cheerleading. Cheerleading has been the most stereotyped sport. I am going to go over all the details that go on in cheer and hope to show that cheerleading is more than big hair, bows, and small outfits. There are reasons for everything we do. And I hope to change some of your perspectives on the world of cheerleading. Be ready to learn about our training, stunting, tumbling, and competitions.